A well-respected leader of her people, Bai Bibiaon serves as the Chairperson Emeritus of the Sabokahan To Mo Lumad Kamalitanan or the Confederation of Lumad Women in Southern Mindanao and as a council of the Salugpongan Ta ‘Tanu Igkanogon (the organization of lumad in Talaingod, Davao del Norte), Natulingan Ta ‘Tanu Igkanogon (the organization of lumad in Sitio Natulinan), and a member of the council of elders of PASAKA Confederation of Lumad Organizations in Mindanao. 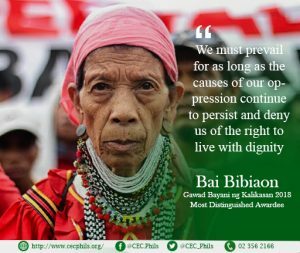 Bai Bibiaon was the most distinguished awardee of Gawad Bayani ng Kalikasan 2018. In May 2017, Duterte declares martial law in Mindanao in which ‘Red-tagging’ of lumad worsens. This stirs fear among the indigenous community and made them displaced from their home. During her acceptance speech during the 5th Gawad Bayani ng Kalikasan, she said, “I want to tell Duterte to end martial law in Mindanao. We just want a peaceful life,” she said in her native language. Currently, Bibiaon Ligkayan and other tribal elders continues to struggle for self-determination and the defense of Pantaron’s forest. The resistance was met with dismay by Duterte’ administration. The administration views the resistance of the tribal community as rebellion and with this, in one of Duterte’s campaign he threatened to bomb lumad schools. This is the way of the administration in silencing the defenders of the forest. But this did not wavers Bibiaon’s resolution to assert their right to their ancestral domain.